Right: Trump World Tower, 2001. The history of luxury condominiums in New York City can be traced back to the mid-1970s when mixed-use skyscrapers such as Olympic Tower on Fifth Avenue and 52nd St. proved the appeal of new locations for high-end, high-rise residences. The dark tinted-glass curtain wall was a material and stylistic vocabulary popularized in office towers like the Seagram Building. Developer Donald Trump adopted the bronzed look for his first signature tower on the Fifth Avenue just south of 57th St., completed in 1983, in which architect Der Scutt used a faceted, sawtooth facade that minimized the tower's bulk and created more "corner offices" on the floors below and directed views in the condominiums on floors 30 to 58. 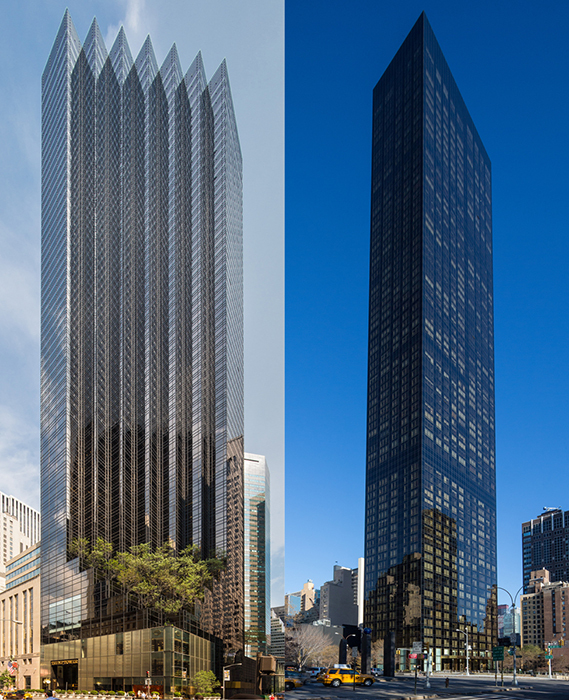 In 2001, Trump added another sleek glass prism to his portfolio: Trump World Tower, which at 861 ft. became the then-tallest residential building in the city. In order to stretch as high as possible, Trump shrewdly amassed the unused air rights from surrounding buildings, including two brownstones, the Holy Family Church, and the Japan Society. Architect Costas Kondylis designed the tower as a slender slab of with a taut dark curtain wall that projected a minimalist sensibility. The large expanse of glass and overall slenderness resulted in the decision of the engineers WSP Cantor Seinuk to include a tuned mass damper at the top of the tower to counteract sway, the first such application in a residential building.